Plush Styles: Editing And Organizing Your Wardrobe. To be stylish is not just about what you wear and how you wear it, it all starts from your wardrobe or closet. How you edit, place and organize your wardrobe determines to a massive extent how you put together your outfit when you step out. A lot people just go shopping, buy a whole lot of stuff they do not need and just dump them all up in their wardrobe confusing themselves when it comes to picking an outfit to step out in. There’s little point in owning the latest bag, dress or shirt if you can’t find it in your closet when you’re getting dressed. Jumbling up clothes in your wardrobe not only weakens the fabrics, it keeps all your clothes un-mantained. Editing and de-cluttering your wardrobe can be a very though task, so i'll list a few tips here to help and if you need professional help you can always send me an email, it's not as expensive as you think. Discard your old clothes: If you aren't wearing it, don't keep it! This can be hard espcially to give up some clothes you love or expensive garments. Take a look at your clothes and assess what you wear most, least, or not at all. If an item is severely damaged or no longer fits, toss it out! Choose what to keep: In choosing what to keep, let seasonality and frequent use be a guide to what goes into your wardrobe or closet. Choose the right hangers: Apart from the fact that your wardrobe will look neater using a particular type of hanger (wood, wire or plastic), hangers play a huge role in preserving your clothes. For example hanging suits or sweaters on thin or wire hangers makes them slouch and loose shape. Use thick wooden or plastic hangers for suits and sweaters. 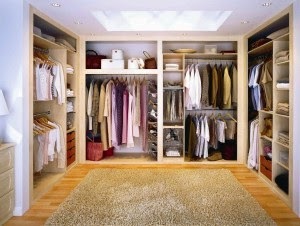 Organizing your clothes: Start organizing by separating your different types of clothes. Suits hanged separately, Tops, T. shirts, blouses should all be hung separately. Blouses and dresses, for example, can be sorted first by sleeve length or by colour. Start with strapless and go to long-sleeve. Keep like with like. The secret is, 'you'll wear more if you see it'. Jeans should be folded away neatly and there are different ways to arrange them, by cut or by colour. Depending on your type of wardrobe (if you don't have drawers or compartments), Use containers, or a matching set of baskets to hold accessories and clothing that can’t be hung, such as scarves, socks and underwear. Rotate your bras and underwear so you’re not wearing the same few all of the time. Jewelry , sun glasses and other accessories, should be neatly stored in your wardrobe drawer or a separate compartment. Purses and bags should be neatly arranged by size and kept visible because it's a bit hard to change bags if you don't see them. Shoes will always take most part of your wardrobe so depending on how rich your are, how massive your wardrobe is or how many shoes you have, you should have a separate closet for your shoes and arrange them accordingly with formal shoes, heels, sneakers, flat shoes all stored separately. If you are not blessed with that much, you can choose between a shoe rack on the floor, a hanging shoe organizer or the original shoe boxes. Store shoes you don’t wear frequently in the least seen place. With these few and simple tips, you are on your way to having a well edited wardrobe so you can always look organised and at your best best when stepping out. Make sure to always keep your closet fresh and de-cluttered.